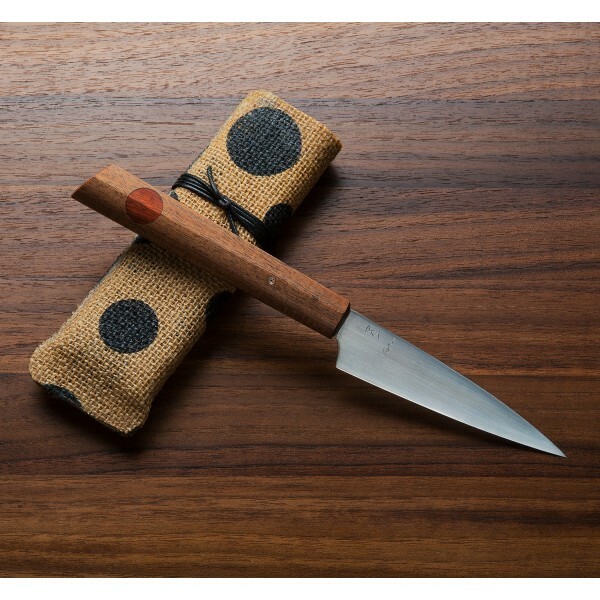 With a new look for Don Carlos Andrade's lightweight, stick-tang construction paring knife design, these feature contoured mesquite wood handles with gorgeous grain, bloodwood inlays, mosaic pins and satin finished 1095 carbon steel blades. With small spots left unfinished, remiscent of Don's "rustic" finish, the thin, 3.75" blade is perfect for hand-held and detail oriented tasks, the 1095 steel holding a hard and razor sharp edge. A handmade cloth covered transport case is included. 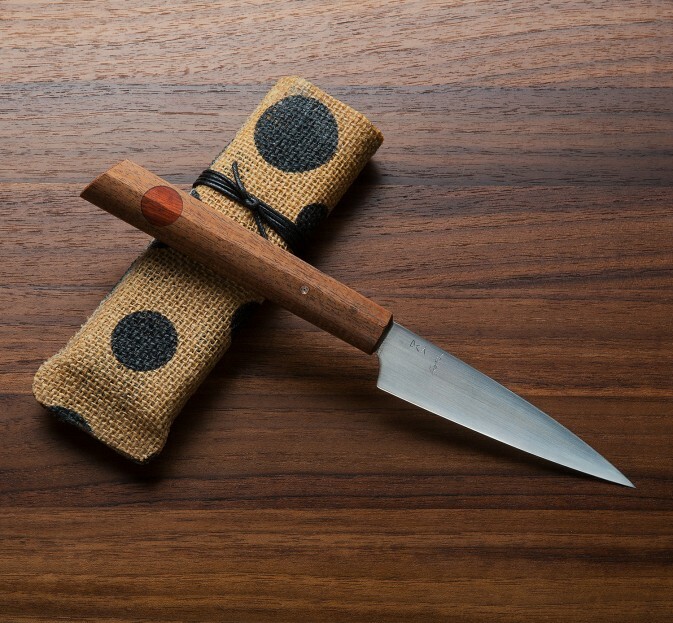 A simple, function-oriented design from Don Carlos Andrade, the stick-tang Satin Mesquite Paring Knife is yet another example of Don's knack for combining form and function to create heirloom quality kitchen knives designed to be used daily. 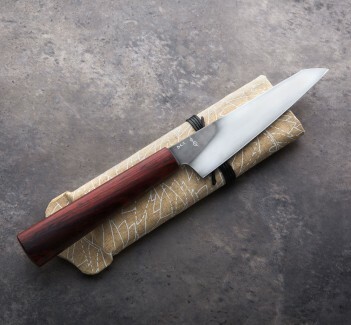 The 1095 carbon tool steel will satisfy the most discerning chefs, and can be sharpened beautifully on your whetstone. 4.2" (106 mm) blade, 9.5" overall. Blade width at the heel: 2.4mm. Blade height at heel: 25mm. Weight: 1.8 oz (52 g). Satin finished 1095 carbon steel blade. 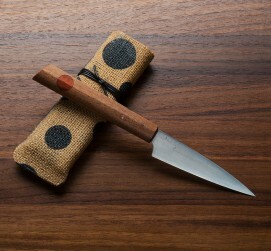 Mesquite handle with bloodwood inlay and mosaic pin. I won this paring knife in a giveaway on Instagram and absolutely love this knife. I am a chef by profession and could not see how one paring knife could be functionally better than another. But the weight, length of handle, thinness of the blade, and edge life proves that a lot of thought was put into the creation of this knife. 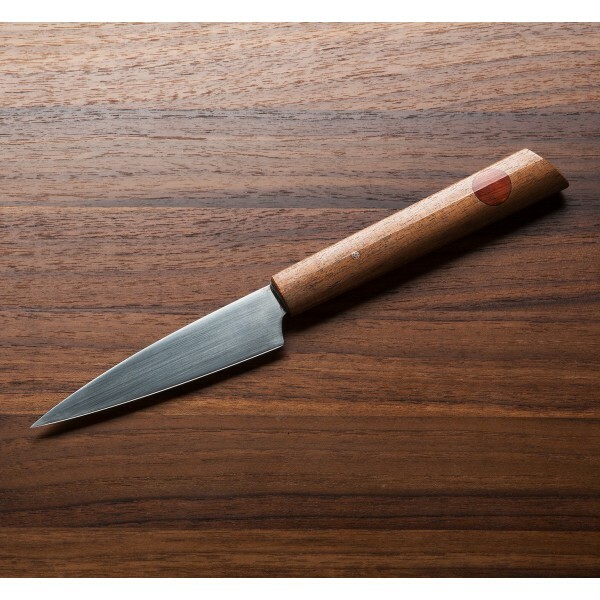 If you have just started cooking, however, I would say invest in something else and understand that a knife like this can't be thrown around and mistreated. 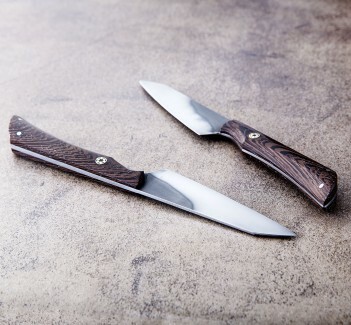 Learn how to take care of a carbon steel knife first. When you decide you need a light paring knife with a long handle for intricate designs or knife work, then invest into a knife like this.